(Milton) “Gordon played better in the last five minutes and that was the difference,” was Curry coach Sean Casey’s accurate assessment of the reason for his team’s loss to visiting Gordon, 77-67, at the Miller Gymnasium on Saturday. The score was knotted at 60 with 4 ½ to play when Gordon reeled off eight straight to surge to the margin that Curry couldn’t overcome. Junior Elliott Blackstone was the spark. 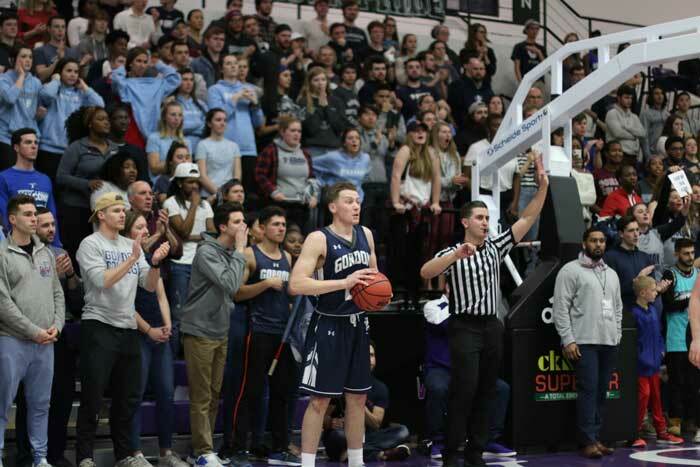 First he split the Colonel defense for a foul-line jumper and then went in strong against the Commonwealth Coast Conference’s best shot blocker, Kyle McNamar. Next Scott Allenby connected on an open jumper from the corner and Scott Beebe followed with two free throws. The victory moves Gordon to 7-2 overall and 2-0 in the CCC. Curry’s losing streak reaches seven and they’re 2-8 overall and 0-2 in the conference. Not surprisingly, Scott Beebe led the way for Gordon finishing with 20 including 12 in the second half. What was surprising, however, was the emergence of an inside game with Joe Witherspoon. “Joe is tough inside and we need to go to him more in there,” said coach Schauer afterwards. Joe (18 points) also helped the Gordon cause by making all ten free throws he attempted. Elliott Blackstone contributed 14 and Josh Sylvester added 10. Keith Fredriksen and Ricardo Graham paced Curry with 15 and Glen Goff added 13 off the bench. Next up for Gordon is Becker College on Tuesday night (8PM) at home. It is a non-league game with an opponent that has lost its first six games.